NASHVILLE, TN – Compass Records artist Noam Pikelny has been announced as the winner of the first annual Steve Martin Prize for Excellence in Banjo and Bluegrass. Pikelny, together with Steve Martin and Punch Brothers, is scheduled to perform on the Late Show with David Letterman on November 4th. 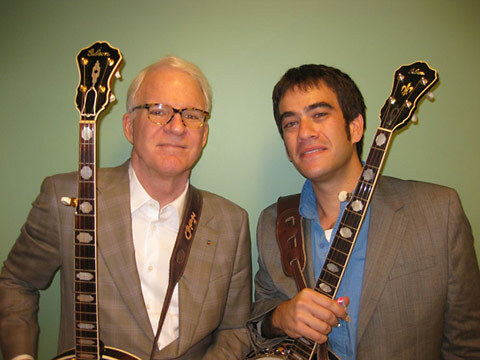 Pikelny was selected to win the award, which includes an unrestricted cash prize of fifty-thousand dollars, funded by the Steve Martin Charitable Foundation, by a board consisting of Earl Scruggs, Alison Brown, Pete Wernick, Tony Trischka, Anne Stringfield, Neil V. Rosenberg, Bela Fleck, and Steve Martin. Pikelny’s first solo album In the Maze was released on Compass Records in 2004 to critical acclaim. Since that time, he has toured with a wide array of artists in the acoustic world including Colorado-based Leftover Salmon and vocalist John Cowan of Newgrass Revival fame. In 2006, Noam was recruited by mandolinist, Chris Thile, for his How to Grow a Woman from the Ground album, eventually leading to the formation of Punch Brothers. Pikelny currently resides in Brooklyn, New York and his most recent work can be heard on the Punch Brothers’ Antifogmatic released this year on Nonesuch Records.